The children could pretend to be holding ‘hot’ sparklers, ensuring that they are not too close to anyone else. This is a good way to reinforce ‘sparkler’ safety and to encourage children to ‘find a space’. When the children are familiar with the different sounds and movements of fireworks, they can pretend to be fireworks themselves to make a beautiful display. For example, ask the children to curl up small, like a rocket stuck in the ground, waiting for someone to light them, then 3..2..1..Zoom! Whoosh! Whiz! Get the children to make an exploding shape with twinkles and sparkles, then fall back to the ground. A group of children can hold hands in a circle and move around like a Catherine wheel, exploring different speeds getting faster and then slowing down. Firework sounds could be played in the background or the children could take it in turns to create firework sounds using drums, shakers and whistles. 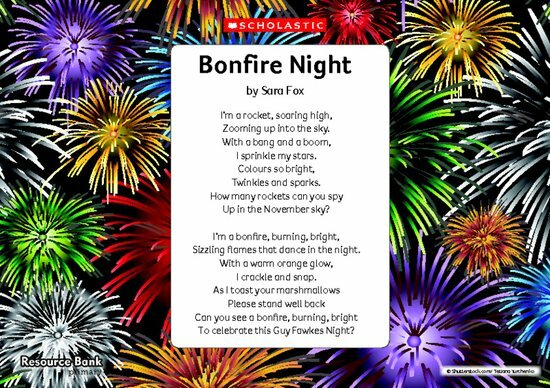 Bonfire night poem – Crackle! Spit!